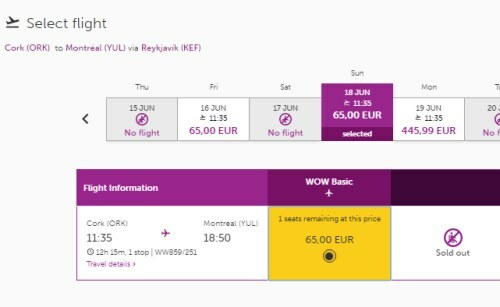 WOW Air is once again showing some really cheap one way flights from Montreal to Europe for $75 CAD including taxes. The actual cost of the 'flight only' is $75 CAD including taxes. With the 'flight only' price of $75, you can bring 1 personal item, up to a maximum of 42x 32 x 25 cm (10 kg or 22lbs). However, to bring a piece of carry-on, is $64 CAD. So if you can get away with just checked luggage, it would be $75 + $90 or $165 CAD for a one way flight to Europe. Update @ 11:30 AM EST - It appears the WOW Air website might be straining under the traffic hitting it right now. At the moment, fares aren't loading at all. They should be back up soon as traffic eases a bit. Update @ 11:35 AM EST - Despite the website issues, I've been able to get from Google Flights to the WOW Air website booking page. See update below. The WOW Air flights coming back from Europe are not cheap. Unfortunately there's not many cheap one way flights from Europe to Montreal in June at the moment. I'll update this blog post if I see any. There's a one way flight from Bristol, UK to Montreal on June 23 for $189 (flight only) to $283 CAD (with checked bag). ^^ go from Google Flights to the WOW Air website. You'll be taken to the UK version of the website. Prices are in pounds. Multiply by 1.77 for the price in Canadian dollars. There's a few flights from Stockholm, Sweden to Toronto on June 19, 22, 27 for $123 CAD (flight only) to $215 CAD (with checked bag). However, you need to book it on the Swedish language version of the WOW Air website. Select June 19, 22, 27 as your date. Click through to the WOW Air website. The flight should show up as 655 Swedish Kronas (751 with taxes). Multiply the Kronas by 0.16 for prices in $CAD. There's also a few one way flights from Brussels, Belgium to Montreal in June for $209 CAD (flight only) to $304 CAD (with checked bag). Go to the WOW Air website, and change your booking country in the top right corner. 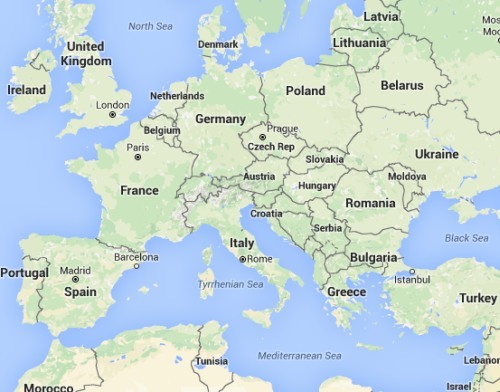 Change it from Canada (English CA) to Belgium (English BE). The flights should show up as 125 Euros (136 Euros with taxes). Multiply the Euros by 1.54 for prices in $CAD. There's a few flights from Cork, Ireland to Montreal on June 12, 14, 16, 18 for $114 CAD (flight only) to $203 CAD (with checked bag). 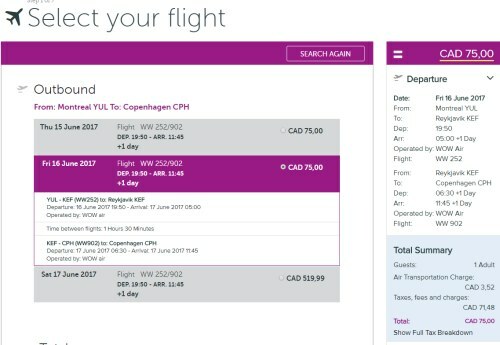 Go to the WOW Air website, and change your booking country in the top right corner. Change it from Canada (English CA) to Ireland (English IE). There appears to only be 1 seat available. The flights should show up as 65 Euros (74 with taxes). Multiply the Euros by 1.54 for prices in $CAD. There's flights from Dusseldorf, Germany to Montreal on June 13, 20, 22 for $209 CAD (flight only) to $298 CAD (with checked bag). However, you need to book it on the German language version of the WOW Air website. The flight should show up as 125 Euros (136 with taxes). Multiply the Euros by 1.54 for prices in $CAD. There's flights from Frankfurt, Germany to Montreal on June 12, 13, 14, 16, 17, 25 for $209 CAD (flight only) to $298 CAD (with checked bag). Change the city to the one you want. Click on the departure date box to select other dates. 2. Select your flight and click through from Google to the WOW Air website. Doing it this way, I can get to the WOW Air booking page. I'm not sure if you'll be able to book it or not, given WOW Air's current website issues. It seems to work though. 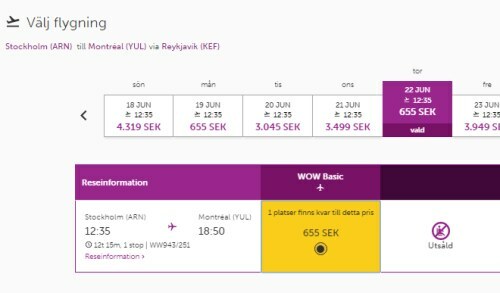 Update 6/29 - Today, WOW Air is offering one-way flights from Montreal to Europe for July and August travel for $150 (flight only) to $240 (with luggage) CAD including taxes. Unfortunately there's not really any cheap one way flights back home from Europe to Montreal in July or August. montreal, yul, europe, western europe, flight deals, stockholm, sweden, arn, nordic countries, northern europe, scandinavia, central europe, united kingdom, london, germany, frankfurt, fra, edinburgh, scotland, edi, copenhagen, denmark, cph, lgw, berlin, sxf, gatwick, uk, bristol and brs.